What is WMV file & Why need to convert VOB to WMV? Windows Media Video, aka WMV, is a compressed video file format developed by Microsoft. The most important aspect of a WMV file is that its format allows large video files to be compressed while retaining high quality. They may be of any size and may be compressed to match any bandwidth (connection speed). So if you have a collection of DVDs, then you may know DVD datas are actually saved in VOB file format. And if you wanna watch these DVD movies on the move or share with others, you’d better convert the DVD VOB to WMV or other popular file format for VOB practically is only used on saving DVD files, then you can enjoy or share DVD movies with your family and friends more conveniently. To convert VOB to WMV, you can use a VOB to WMV converter. Just read through the article below to easily convert VOB to WMV. Pavtube Video Converter Ultimate (to get Mac version) enables to achieve the VOB to WMV conversion easily and with high quality. It is a complete toolbox with the function to play, convert, edit, videos. Apart from converting VOB to WMV, you can import MOV, VOB, M4V, MKV, AVI, MP4, even DVD and Blu-ray to this software and convert to any format you need. If you want lossless video quality, splitting feature is also supported. You can split VOB file by time, length and time. Other features like trim and crop are offered, too. But it can’t compress VOB video size markedly. Directly drag and drop the VOB file into the software. This video resizer supports batch conversion. So you can add multiple VOB files to resize video by batch. Click the "Format" icon, which leads to a pop-up window. 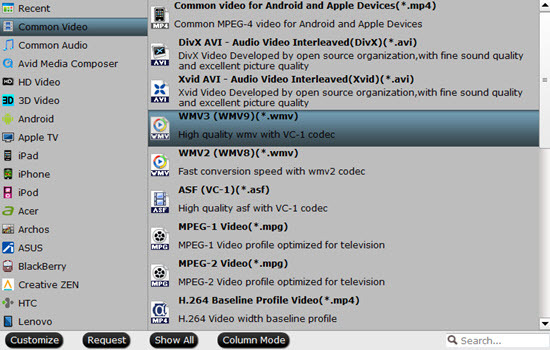 In the "Output Format" window, choose WMV as the output format. You also can set the other parameters of the file by hiting the "Settings" option, if you have any need. Or you can ahead to next step to converting VOB to WMV now. Click the button "Convert" to start the conversion. Then click "Open" to find out where the output files are saved. If you want to save the output files to the location to your own taste, click "Browse" to set the output folder before conversion. How to Convert Ripped VOB Files into H.264/H.265?